Bulking Agents: Microcrystalline Cellulose, Dibasic Calcium Phosphate, & Pregelatinised Starch, Magnesium Oxide, Vitamin C (Ascorbic Acid [Carrier: Glyceryl Tristearate]), Polyvinylpolypyrrolidone, Anti-Caking Agents: Stearic Acid, Silicon Dioxide, Purified Talc & Magnesium Stearate, Tablet Coating (Hydroxypropylmethylcellulose, Ethyl Cellulose, Propylene Glycol, Natural Source Colours: Titanium Dioxide, Red Iron Oxide), Vitamin E (D-Alpha Tocopheryl Acid Succinate) (from Soya), Phosphatidylserine (from Soya), Phosphatidylcholine (from Soya), L-Arginine, Pantothenic Acid (as Calcium Salt), Thiamin (Vitamin B1 as Mononitrate), Zinc Sulphate, Ginkgo Biloba, Niacin (as Nicotinamide), Polyvinylpyrrolidone, Vitamin B12 (Cyanocobalamin [Carrier: Dicalcium Phosphate]), Ferrous Fumarate, Hydroxytryptophan, Vitamin B6 (Pyridoxine HCl), Natural Mixed Carotenoids (Betacarotene, Vegetable Starch, Antioxidants: DL-Alpha Tocopherol, Sodium Ascorbate), Co-Enzyme Q10, Potato Starch, Glutamine, Manganese Sulphate, L-Glutathione, Riboflavin, Ethyl Cellulose, Vitamin D3 (Cholecalciferol [Carriers: Medium Chain Triglycerides, Colloidal Silica, Talc, Maltodextrin, BHA, Ethylcellulose]), Copper Sulphate, Folic Acid (as Pteroylmonoglutamic Acid), Sodium Selenate, Chromium Trichloride, Potassium Iodide. Allergy Advice: For allergens, see ingredients in bold. Omega-3 Fish Oil (Docosahexaenoic Acid Concentrate) (from Fish), Capsule Shell: (Pharmaceutical Grade Gelatin, Glycerine, Natural Flavour Lemon Oil). Allergy Advice: For allergens, see ingredients in bold. PLUS ONE CAPSULE (PINK BLISTER) PER DAY. This comprehensive formula replaces other Neurozan multivitamins. There is no need to take an additional multivitamin. This product contains iron, which if taken in excess by very young children may be harmful. As with other food supplements, consult your doctor or pharmacist before using if you are under medical supervision, pregnant, breast-feeding, have epilepsy, a thyroid condition, haemochromatosis, suffer from food allergies, or are allergic to any of the ingredients. Not suitable for children. Allergy Advice: For allergens, see ingredients in bold. Made in a site that may handle nuts. If you are taking anticoagulants do not take this product except on the advice of a doctor. Contains fish oil sourced from fish. Food supplements must not replace a varied and balanced diet and a healthy lifestyle. Not to be taken on an empty stomach (see directions). Why has Neurozan Plus been developed? When is Neurozan Plus recommended? Can Neurozan Plus be used simultaneously with medications? How many tablets and capsules does one pack of Neurozan Plus contain? How and when should Neurozan Plus be used? Are there any undesired side-effects whilst taking Neurozan Plus? 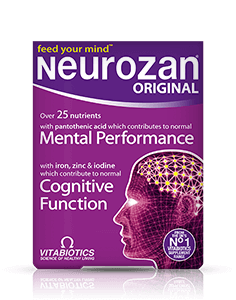 Is Neurozan Plus recommended with any other Vitabiotics product(s)? Is Neurozan Plus suitable for vegetarians? 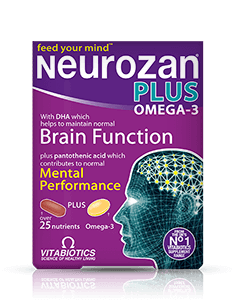 Neurozan Plus combines the latest research based micronutrients for normal brain & cognitive function with a high purity 60% Omega-3 capsule. The formula includes 5-HTP, phospholipids & amino acids, plus iron, zinc, iodine & omega-3 DHA which contribute to normal brain & cognitive function. Neurozan Plus is recommended for both men and women of all ages and is also ideal for those studying for exams or professional qualifications, especially during examination periods. Generally, Neurozan Plus may be used alongside medications because it contains only moderate levels of vitamins and minerals, and is free from any drugs and hormones. For specific advice on taking Neurozan Plus with medicines, we recommend that you contact your doctor or pharmacist first. Neurozan Plus contains 28 tablets and 28 capsules in a dual pack. One tablet and one capsule per day is recommended with or immediately after your main meal, with water or cold drink. Neurozan Plus tablets and capsules should not be chewed and should only be taken on a full stomach. Taking the tablet and capsule with a large meal maximises the absorption of the nutrients, and can reduce nausea, which is sometimes experienced if multivitamins are taken on an empty stomach. Always ensure that Neurozan Plus is taken with plenty of liquid to wash the tablet/capsule down. Neurozan Plus has no known side-effects when taken as directed. Do not exceed the recommended tablet and capsule intake. In case of overdose, seek medical advice immediately. Neurozan Plus capsules incorporate natural lemon oil to help prevent any after taste. Results vary amongst individuals, but in most cases, we would expect the beneficial effects of specialist nutrients in Neurozan Plus to build over several weeks. There is no maximum length of time over which Neurozan Plus may be used. A regular intake is recommended. Calcium is an essential mineral and is needed for the maintenance of normal bones. However, it has not been included in the Neurozan formula, since it is not possible to include the right amount in a single tablet. Rather than including just a token amount of calcium, Neurozan has therefore been formulated so that it can be used with Vitabiotics' Osteocare tablets or liquid. No, Neurozan Plus is not suitable for vegetarians as it contains fish oil in a gelatin capsule. Adults can obtain DHA and EPA indirectly through the conversion of the essential fatty acid alpha-linolenic acid (ALA), present in vegetable oils such as linseed but this process is very inefficient. Neurozan Plus contains fish oil as it provides a much more reliable, direct source of DHA & EPA. Vitabiotics avoids 'mega dose' levels of isolated nutrients and instead we have always stressed the importance of safe, moderate and sensible levels of vitamins and minerals, carefully balanced to maximise their combined effect; an approach which has been supported by many experts and researchers over the years.